The following diagram illustrates the typical Veeam ONE deployment scenario. 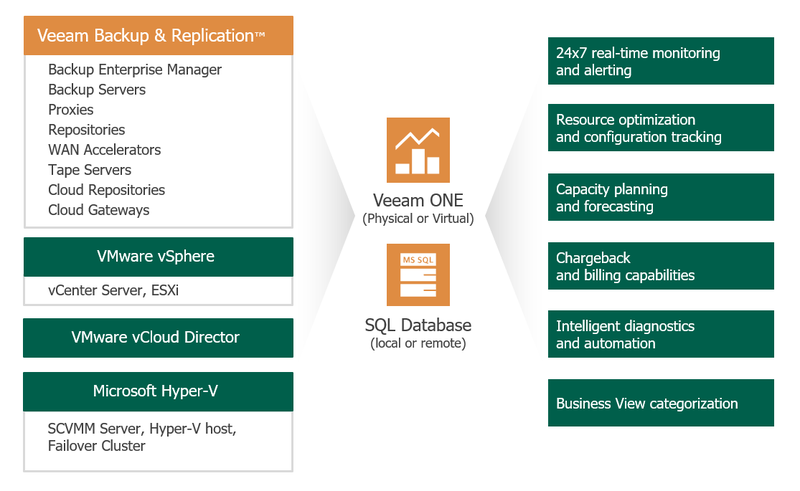 All Veeam ONE architectural components (Veeam ONE Server, Veeam ONE Web UI, and Veeam ONE Monitor Client) are installed altogether on a single machine (either physical or virtual). To store data retrieved from connected servers, a local or remote Microsoft SQL Server instance is required. If you have a Microsoft SQL Server instance that meets Veeam ONE system requirements, you can adopt it for Veeam ONE deployment. Otherwise, you can install a new Microsoft SQL Server instance during the product installation — Veeam ONE setup package includes Microsoft SQL Server 2012 SP4 Express Edition and Microsoft SQL Server 2016 Express Edition. To enable multi-user access to real-time performance statistics and configurable alarms, you can additionally install one or more instances of Veeam ONE Monitor Client on separate machines. Thus, you will be able to access Veeam ONE functionality either from a local machine or from remote computers. For instructions on the typical deployment procedure, see Typical Installation.